Development began in 2015 following the completion of Rise of the Tomb Raider, lasting until July 2018. 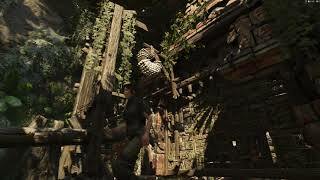 Shadow of the Tomb Raider was designed to conclude Lara's journey begun in the 2013 reboot, with a key theme being descent both through the jungle environment and into her personality. The setting and narrative was based on Mayan and Aztec mythologies, consulting historians to design the architecture and people of Paititi. The gameplay was adjusted based on both fan feedback and the wishes of Eidos Montréal, incorporating swimming and grappling while increasing difficulty tailoring. Camilla Luddington returned to provide voice and motion-capture work for Lara. The story begins two months after Rise of the Tomb Raider. 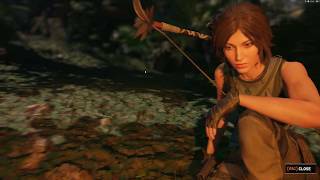 Lara Croft and her friend Jonah Maiava have spent the intervening time tracking and stopping the activities of cells belonging to the paramilitary organization Trinity. Following clues left by Lara's late father Richard, the two track a cell led by Pedro Dominguez, head of Trinity's High Council, to the Mexican town of Cozumel. Slipping inside nearby tombs being investigated by Trinity, Lara first discovers references to a hidden city, then a temple containing a dagger; accompanying murals contain apocalyptic warnings and to a "silver box" and the Cleansing, a Mayan apocalypse consisting of massive cataclysms culminating in a permanent eclipse. To stop Trinity possessing it, Lara ignores the warnings and takes the dagger. Dominguez catches her, revealing that her actions have triggered the Cleansing. After taking the dagger from her, intending to stop the Cleansing and remake the world in his image after finding the Box, Lara and Jonah narrowly escape the first cataclysm, a tsunami that obliterates Cozumel. Despite growing tensions between them over her actions, Lara and Jonah use their clues to pursue Dominguez to the Amazon. Their plane crashes during the second cataclysm—a massive storm—and the two find their way to Paititi, the hidden city of the murals, with help from a local named Abby. Exploring local tombs reveals the dagger and box belonged to the respective goddesses Chak Chel and Ix Chel, and piercing the box with the dagger will sacrifice the god Kukhulkan and halt the Cleansing. Along the way, Lara witnesses Trinity soldiers being slaughtered by strange monsters. After Lara saves a boy named Etzli, she and Jonah are brought into Paititi by his mother Unuratu, queen of the city. There Lara sees Dominguez as the leader of a cult dedicated to Kukhulkan. Unuratu reveals "Dominguez" as her brother-in-law Amaru, who was taken by Trinity as a child; she now leads a rebellion against his influence. Unuratu points Lara to the location of the next clue. After finding it, she witnesses Etzli being kidnapped by the Cult. She and Unuratu join forces to infiltrate the Cult's stronghold to both rescue Etzli and obtain the box. Though they rescue Etzli, Unuratu is captured and Lara learns that the box was stolen. She also encounters the creatures from before, which she later learns are the Yaxxil, guardians of the box. Disguised in a cultist, Lara tries to rescue Unuratu. During the rescue, she overhears Amaru say that the box was hidden by a former Trinity member named Lopez who was driven insane by its influence. Though Lara receives another clue, Unuratu is shot by Rourke, Amaru's second in command. Before dying, Unuratu warns Lara not to let the box influence her. Leaving Paititi to decipher the clue, Lara and Jonah are attacked by Rourke and separated. Though Lara makes it to an oil refinery to meet Jonah, Rourke contacts her and claims he killed him. Lara snaps, going on a rampage that destroys the refinery and slaughters everyone there except Rourke. When she finds Jonah alive, she momentarily breaks down, but Jonah revives her and they decipher the box's location; a mission of San Juan near Paititi. Driven to the mission by Abby, they find a secret catacomb beneath a church that leads to Lopez's tomb inside which is the box. However, Amaru finds them, takes Jonah captive and forces Lara to hand over the box. He reveals that he ordered Richard's death to prevent him from finding Paititi and revealing it to the world. Despite this, Lara tries to get him to just stop the Cleansing and not carry out his plan. When this fails, Jonah breaks free and steals the box, forcing them to fight their way out. Unfortunately, Amaru takes the box back and leaves them to escape the third cataclysm, a massive earthquake that destroys the mission. Back in Paititi, Lara and Jonah help the newly-crowned Etzli lead a two-pronged assault on an underground temple complex at Paititi's centre to disrupt Amaru's ceremony while avoiding the fourth and final cataclysm, a volcano eruption. After Trinity cuts off Etzli's forces, Lara is forced to go on alone. Coming across the Yaxxil's leader "Chak Chel", she convinces them to help her stop Amaru, taking on the symbolic role of "Ix Chel". While the Yaxxil kill Rourke and the High Council, effectively ending Trinity, Lara makes it to the temple summit, but fails to stop Amaru from piercing the box, filling him with Kukhulkan's power. Lara retrieves the dagger and uses it to kill him; accepting defeat, Amaru transfers the soul of Kukhulkan into Lara as he dies. True to Unuratu's warning, she is tempted to use the box to revive her parents, but manages to resist. Instead, she lets "Chak Chel" symbolically stab her as "Ix Chel", sacrificing Kukhulkan's spirit and stopping the Cleansing by preventing the death of the Sun by the solar eclipse. In the aftermath, Unuratu is laid to rest, and Lara helps Etzli restore Paititi to its former glory while Jonah decides to take a vacation with Abby. 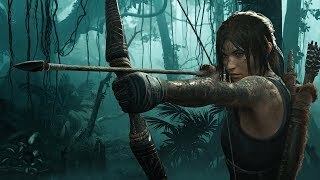 In a post credits scene, Lara returns to Croft Manor for the first time in years and plans her next adventures.